We Canadians have a love/hate relationship with snow. At least I do. I'm not a skier. I don't snowshoe. I don't often toboggan. I like to witness the beauty of fresh snow on Christmas Day, but come January the snow could go bye-bye as far as I'm concerned. Since that's not likely to happen, I'll try to make the best of it. After all, my kids love to get out in the snow and get active. Plus, snow days call for indoor fun as well - nestling by the fireside with hot cocoa and a shared family game or craft. 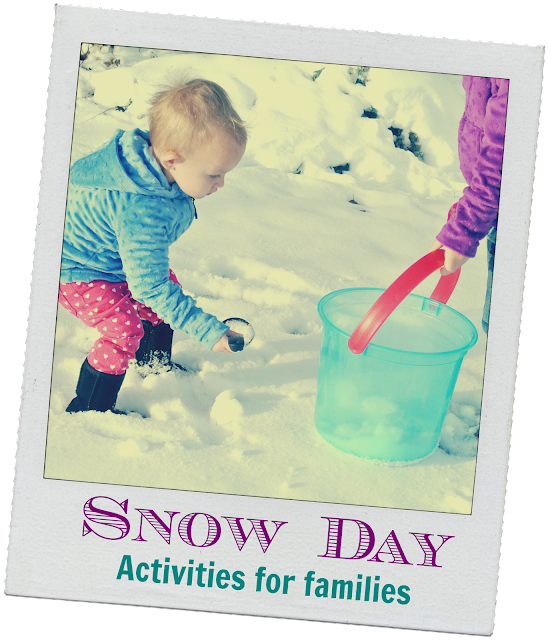 For inspiration, I turned to my Canadian blogger friends to find out what indoor and outdoor activities they like to share with their children on snowy days. Melissa of MommyKnowz likes to build snowmen. Like Lori, she also gets her gang out painting the snow with water and food colouring. She recommends avoiding the use of yellow food colouring though! Jody from Mommy Moment says that having young children aim the coloured spray at a target such as a snowman can strengthen the hand muscles and help kids with their cutting, writing and fine motor skills. Tammy, the mother of four children and the blogger at In R Dream, even makes snow slushies using clean snow and juice! Melissa suggests filling balloons with water and food colouring, freezing them (either in a large freezer or outdoors) and then taking the balloons off to created frozen coloured balls. Make "pins" out of snow and use the balls to bowl on the sidewalk. Toronto blogger and mother of five Jenna of Snymed.com recommends that you make use of your beach toys in winter by creating snow castles rather than sand castles. Olivia of This West Coast Mommy doesn't see as much snow as those of us who live farther east. Her family makes the most of the snow they do get by building snow bunnies and other small animals rather than snowmen. Over at Whispered Inspirations, Nancy and her two little girls like to build snow forts. "There's nothing more classic than building forts, splitting up the family and having a snowball fight," says Nancy. "Hot chocolate to follow." On snow days, Kim of Tales of a Ranting Ginger likes to kick back with her family drinking hot chocolate and watching kid-friendly movies. That's pretty much my speed right there! 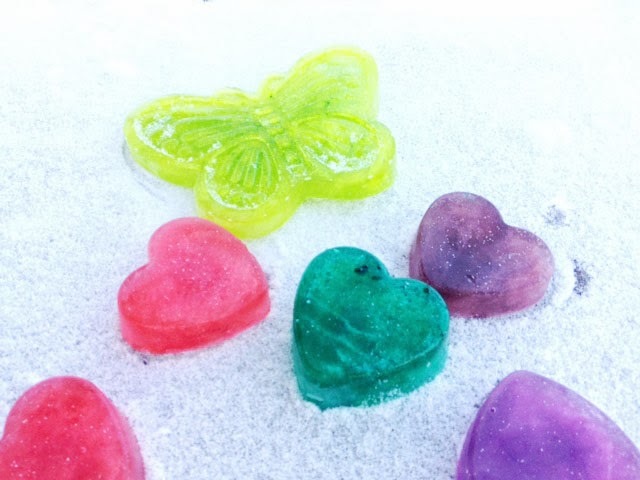 Lisa from The Baby Bottom Line does a ton of indoor crafts on snowy days. Her family particularly enjoyed making salt dough ornaments this year. They also love outdoor activities like skating at the outside rink and grabbing the snow racer to hit the hills. Julia is a woman after my own heart. She and the family like to do crafts, bake and cook simple, tasty treats. "The anticipation of waiting for cookies or a cake in the oven while we play a game or craft is priceless," says Julia, who writes Ask Mama MOE. Browse my recipes section if you need inspiration. Peanut butter and chocolate chip cookies maybe? Sandi of Canadian Blog House says a walk to the toboggan hill is "a must on a snowy day." The family spends a couple hours tobogganing and then it's home for hot chocolate, a fun movie and a cuddle on the couch. Paula's family bundles up after dinner, turns the yard lights out and plays tag in the dark. The writer of Thrifty Mommas Tips says they also enjoy putting on their snowpants and sliding down their slide in the snow. "When that sucker ices over we fly," she says with a laugh. "One time I almost flew into the neighbour's fence." MapleMouseMama Suzanne has her very own hill, so her kids can use their sleds right in the backyard! After sledding, it's time for hot chocolate, cookies and a board game like the Game of Life. The family also recently came up with their own lyrics for The 12 Days of Christmas. Ashley of Tales of Mommyhood makes the most of snow days. She and her boys shovel the walkway, build snowmen, craft and just enjoy the opportunity to spend quality time together without any commitments. If you want more ideas for snow day fun, visit Kristen at Baby Giveaways Galore. She has 25 outdoor winter activity ideas for kids. What's your favourite snow day activity? So fun!! We've had a few flurries, but no big snows since the one a few weeks back-- but we do love a good snowball fight 'round these parts! All great ideas! I am with you Jo once Christmas is over I dont want to see any more snow. The one thing we always did as kids and I know do with my son, is put out a bowl when it is snowing to get fresh snow, then we pour real maple syrup in the bowl, a yummy treat! Enjoy the last few days of 2013!